This article includes highlights of the MyCouponize adware issue on Mac and provides a tutorial on removing the associated unwelcome ads from web pages. It’s definitely a nuisance when multiple ads inflate every web page visited by a Mac user. Regular ecommerce campaigns typically aren’t too irritating and preserve the balance between user experience and effective product promotion online. It’s all entirely different when a PUP (potentially unwanted program) like MyCouponize comes into play. In this case, numerous redundant advertisements will be occupying the greater space of websites accessed from a Mac machine compromised by said offending code. These obnoxious objects include large comparison shopping blocks, deals, banners, hyperlinked inline text and full-page interstitial ads. It’s important to delineate the difference between adware activity and commonplace advertising on the Internet: the former only affects hosts previously hit by a culprit like MyCouponize. The adware under scrutiny tends to slither its way into Macs as part of bundled downloads. Again, there is a thin line between run-of-the-mill application bundling and one that poses risk to computers. The dark facet of this matter revolves around the inclusion of PUPs into compound freeware installation clients. Unfortunately, most users accept the default setup option in such scenarios without even paying attention what else is on board. By going the ‘custom installation’ route instead, people will usually see the full list of programs being cross-promoted and be able to deselect what they deem potentially excess or harmful. Anyway, the click-through habit isn’t a good thing when it comes to Mac software bundles as it may well lead to unauthorized installation of malicious entities. This particular infection tends to infiltrate systems via booby-trapped Adobe Flash Player installers. When MyCouponize virus ends up inside a computer, it adds a new extension to Safari, Chrome and Firefox if detected. While running in the background, this cross-browser add-on spawns a virtual layer on top of websites visited by the victim. It’s this layer that encompasses the entirety of undesired sponsored content being displayed during web surfing sessions. To add insult to injury, the adware also deploys a kind of reconnaissance on the plagued machine. It tracks the user’s web browsing history in order to build a profile based on their lifestyle and interests and display targeted ads. Therefore, there is obviously a distinct spyware hue in this attack. Ultimately, victims are confronted with irritating ads all over web pages and run the risk of getting their privacy infringed. Read the following sections carefully to learn how to sort things out if MyCouponize virus is causing your Mac to act up. When confronted with malicious code like the MyCouponize virus on Mac, you can neutralize its toxic impact by leveraging a specially crafted system utility. The Freshmac application (read review) is a perfect match for this purpose as it delivers essential security features along with must-have modules for Mac optimization. This tool cleans unneeded applications and persistent malware in one click. It also protects your privacy by eliminating tracking cookies, frees up disk space, and manages startup apps to decrease boot time. On top of that, it boasts 24/7 tech support. The following steps will walk you through automatic removal of the MyCouponize Mac infection. 4. 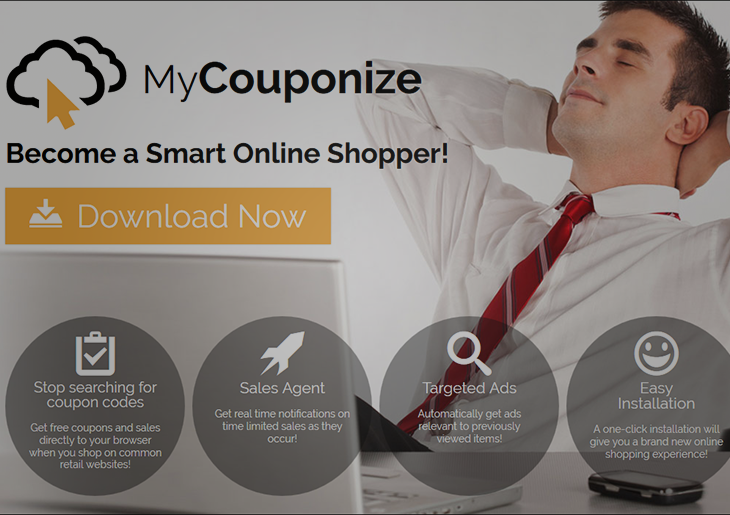 Check whether the MyCouponize ads problem has been fixed. If it perseveres, go to the Uninstaller option on Freshmac GUI. Locate an entry that appears suspicious, select it and click Fix Safely button to force-uninstall the unwanted application. 5. Go to Temp and Startup Apps panes on the interface and have all redundant or suspicious items eliminated as well. The MyCouponize malware shouldn’t be causing any further trouble.